SCR values durability. The woods we offer uphold that value, as each is naturally strong and long-lasting. Even the strongest of woods, though, could use a good stain. Below are products that will help keep your wood frame as sturdy and lustrous as the day you built it! 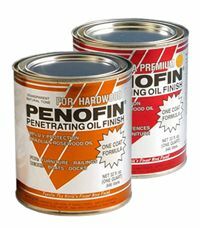 We offer two kinds of PENOFIN® PENETRATING OIL TREATMENT: one for exotic hardwoods (Ipe and Balau) and one for cedar. These oils are not absolutely necessary, but they will provide added protection and will keep the wood from fading in color. For property owners interested in a more subtle color and less upkeep, leaving your wood frame untreated is definitely an option. For those who wish to more actively maintain the appearance of their frame, however, we recommend oil treatment. Make sure to select the correct VOC for your area. Regardless of whether you choose to treat your wood or not, we suggest sweeping and hosing down your frame as needed, in terms of general upkeep. If you plan to order Ipe or Balau posts or top rails, we suggest also purchasing HARDWOOD END GRAIN SEALANT. This waxy product will seal the end grain of hardwood boards, protecting them from splitting, cracking, or checking.